Each and every prospective puppy buyer is asked to fill out this questionnaire with honesty and openness, and then sign and return it. 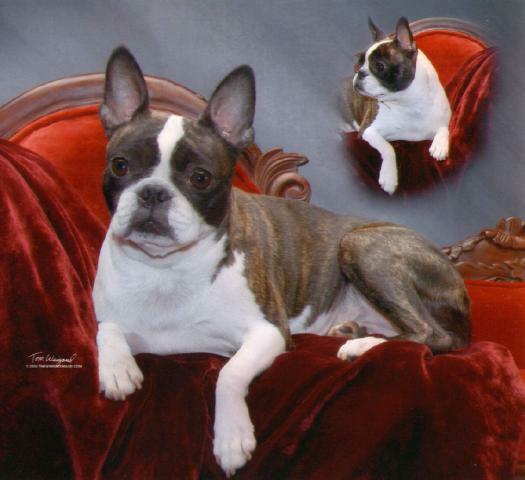 This will help me to determine whether a Boston Terrier is well suited for you and your lifestyle, as well as help me determine what traits you are seeking in a Boston Terrier puppy. If you have a P.O. address, please give street address as well. Would you be interested in a Rescue Dog if one was available that met your needs? Please list names/species/breeds of other pets you have previously owned. If they died, list the age and what they died from. Or did you have to sell, place or give them away? Do you agree that it is in the best interest of your new puppy to take it to at least a puppy kindergarten/beginners obedience class, and will you show me proof of graduation? Will you agree to only use positive reinforcement in your training methods with this puppy? Will you take extra precautions so that your puppy will never be left in a car during warm weather as temperatures can rise to dangerous levels very quickly so the dog will not die from heat exhaustion? Yes ___ No ____ I have had one of my Boston's die from this on a cool day while the owner was away from the car for just a few minutes. You must use EXTREME caution! Please use the reverse side of this page if you need to list additional Veterinarians and Clinics. for any reason without my consent. I am available 24/7 in an emergency. If you reside a fair distance from me, would you agree to have a home visit performed by a qualified Boston Terrier person who lives in your area? I may ask them to bring one of their Boston Terriers with them so you can see how a puppy would interact in your home and yard. I have completed this questionnaire to the best of my ability and I have answered the questions truthfully and honestly. If I am allowed to purchase a Boston Terrier from Achates Boston Terriers, I promise to always keep the best interest of this animal at heart in the day to day decisions that I make, that may affect its life and well being. If you purchase a puppy from me, you will always be able to contact me for help in any questions that you may have concerning the care and health of your new puppy. You may complete this questionnaire and return it to me by e-mail, fax or "snail mail". Just delete the lines I provided for you to write on and type in your answers in a contrasting color. Where a signature is required, TYPE: "I do" or "I Do Not Agree" and your name which serves as your electronic signature. If you take great care of my puppy, I will be your friend for life.